A whisky investment needs a good whate of wheturn. Whisky investment is the hot topic among my friends. A very nice-looking Tasmanian distillery is offering a great deal. You buy a barrel of whisky now, and they keep it for you. In four years it matures and you get a choice. You can either get your money back, plus a 9.55 per cent per annum return, compounded, – or you can have the barrel bottled and take delivery of a whole lot of bottles of whisky. Or a mix of money and whisky. This model is well-established in the wine growing regions of France where it is called En Primeur. Top Bordeaux vintages are sold out while the grapes are still green. The concept makes even more sense for a distillery – the time between first harvesting the grains and having a decent, drinkable product is long. The distillery needs capital to cover that period. They are also busy promoting the Whisky. There are four bars in operation – three in Brisbane and one in Melbourne. They also have Queenslander and Australian cricket legend Matthew Hayden as a sort of brand ambassador. His face is all over the website. The Nant Distillery Company is registered in Brisbane, and that’s where its CEO Keith Batt seems to be from. His LinkedIn profile gives a sense of his business skills. This business seems to be run by someone credible. So why not just get a bank loan? Does it make sense for a distillery to pay a whopping 9.55 per cent per annum on its capital? A residential secured fixed term small business loan goes for 7.1 per cent, according to the RBA. But that is a secured loan. If you go broke the bank gets your house. The difference here is that the barrel owners will not be “secured” creditors. I’ve been to quite a few creditors meetings in my time as a financial journalist and the difference between being a secured and an unsecured creditor can be the difference between millions and zip. The investment is only a good one if you think the risk is low. How bad could it be? Is this a scam? Keith Batt bought the distillery in 2004, and from what I can see the first mention of Whisky investments was in early 2010, around the time of their first bottlings. I guess those first people should have cashed out their Nant investments by now, but I haven’t found anyone raving about it online. Let’s assume it’s all above board and look at the gritty details. The price of the “Great Australian Cask Offer” is $30,000 for two 225L barrels. 450 litres @ $66.66 a litre. You can buy smaller amounts too (225L and 100L), and weirdly they work out slightly cheaper, at $66/L. That price, for the people playing along at home, is high. A litre of Johnny Walker Black Label would be $61.21, and that is in a bottle, in a Dan Murphy’s near you. Not down in Tasmania in a barrel you can’t drink for four years. You also need to take into account GST (which is included in the $30,000 price, and which you can claim back if you have an ABN) and what they call the “angel’s share” – evaporation. Every litre turns into say 900mL over four years. But you’re not exposed to the cost of that shrinkage if you sell them back the barrel. The Big Question is whether they’ll be able to afford to buy it back. 1. The company is solvent but the whisky is destroyed. There could be a mudslide, or that pretty antique building could collapse. Termites might get in the barrels or vandals might break down the doors. Do you technically own the asset? Who has to insure it? Is it insured for the amount you paid, the amount you were promised in return, or its market value? 2. The whisky is fine but the company is insolvent. Do liquidators have to give the whisky back to the investors? I doubt it. I suspect they sell them off to pay back secured creditors. So the whisky investment is a risky investment. That’s why the return is good. But even risky investments don’t go bad every time. And in fact there are examples of such an investment scheme actually adding value to a company. There’s a burrito bond on offer in the UK, for example, which has raised 1.8 million pounds. The owner of that Mexican food concern sees it as a marketing coup: “We now have hundreds of extra brand ambassadors,” says Chilango co-founder Eric Partaker. In a crowded whisky market where the skills to distinguish good whisky from bad are the province of relatively few, having hundreds or thousands of people with a vested interest in believing your whisky is worth every penny might be the smartest marketing ever. EDIT: The prospectus is here: Prospectus for 100L barrel. It talks a lot about volume growth at the top end of the market and the rise of premium and super-premium brands. 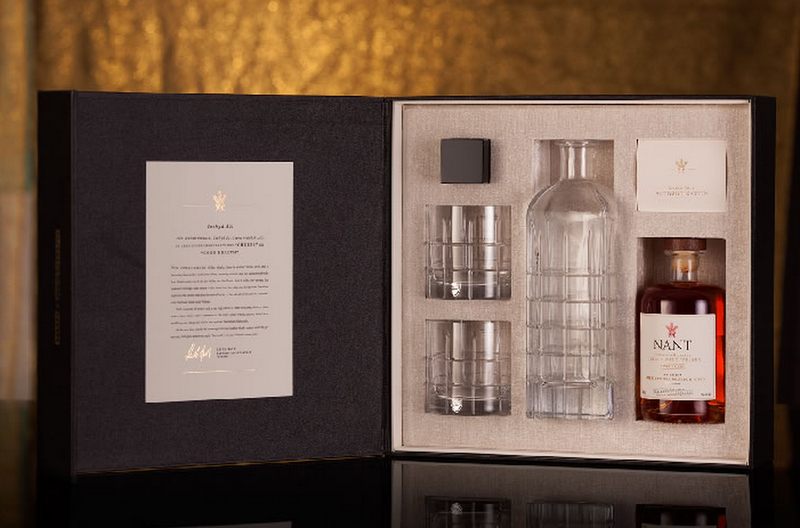 The whisky is insured by Nant, but the details are few. Private super funds that buy barrels (the last barrel offer was very popular with self-managed super funds) can buy additional insurance for fire and perils, theft and accidental damage. You could also insure separately; how much you insure it for would be your choice. When you buy into the offer you get the title to the whisky. If the company goes solvent they cannot sell your property to pay their debts. You do not get the title to the barrel, however- barrels are worth a lot. This of course leaves you with the problem that, in the event of Nant going out of business, you are left with ~100 litres of whisky in a barrel you do not own stored in a warehouse you do not own, both of which will soon be liquidated, pardon the pun. Getting your whisky home might be tricky. So the risk is mitigated quite a bit by getting the title. But not entirely. The fact you get the title is good for them if the whisky somehow turns out bad or goes missing, but good for the investor if they go broke. As to how you get it out of the barrel without taking the barrel… perhaps a straw? Also, I’d be absolutely fascinated to see their books. The price per litre for production can’t be $66, and I suspect that the invested money is bankrolling the whisky bars and paying Matthew Hayden. Now, four years after they first made this offer, probably represents Peak Cash. Soon they’ll have plenty of outgoings too. But in the meantime I wonder what else they put the $ into. Shares? Term deposits? Something else? The brochure is full of vintage puns, but not as tasteful as your title. Which unfortunately is pointless because whiskey is not the investment, it’s just backing the 4-5 year-bond at 9% you will cash up at the term. They make you buy their stock (dead money for them) at a higher price than it costs to produce, while it gains value that they will get back after you sell it back (which 99% will do, to costly keep tax, bottling fee, transport, storage…). It’s on the rock for Nant and for the buyer if Nant goes down you end up having a cumbersome commodity unpacked. This risk is paid at 9% compound interest. Or, or, you and your friends are big connaisseurs and drinkers. Nant being quality you end-up saving money on 100L (minus 20-30% of angel’s share, minus $6,600) you would have spent on ready to enjoy liquid gold. the after tax return is better than a 9% bond since you would get the 50% capital gains tax discount on the increase in value of your whiskey. But I won’t be rushing to secure a barrel. I think you will do better than 9% with high dividend paying shares or real estate over the next 4 years. Previous Previous post: Where in Australia should you buy a house? Next Next post: Innovation: the Concept that Couldn’t.